Israel's NPPO has provided an update to last year's announcement that TR4 had been observed at two separate locations in 2016 and susbsequently declared eradicated after the implementation of containment measures. The disease was recently discovered at a number of sites close to one of the two locations in the eastern/southern Lake Galilee area. As before, the infected sites have been confined and placed under strict supervision by the NPPO. The infected banana mats, as well as the symptomless ones in a five mats radius, have been fenced off and the plants destroyed. The plantations with infected sites have also been fenced off, and have had their access restricted. Entry is allowed only under strict quarantine conditions. Water ditches have been dug around the fenced areas to prevent the spread of spores in rain water. The pest status of TR4 in Israel has been amended to: Actionable, under eradication. The latest installement of the Biosecurity Queensland newsletter includes an item on the options for farming on TR4 affected land. If a grower has TR4 on their farm and they want to use a section of land to farm other crops or manage livestock, they need to meet certain biosecurity requirements. The TR4 programme has produced factsheets on managing the risks for mixed farming and cattle grazing. In another news, scientists analyzing 451 samples of tissue from the upper part of the banana plant and fruit have re-confirmed that TR4 does not infect the fruit. The Queensland Department of Agriculture and Fisheries has released the review of Biosecurity Queensland's Tropical race 4 (TR4) programme conducted by ACIL Allen Consulting. It had commissioned the independent review to establish on what basis the programme should continue. The programme started in 2015 as an emergency response to the identification of TR4 in Tully Valley. Once it was established that TR4 could not be eradicated, the programme shifted to control and containment. All the elements are required to deliver on the programme’s objectives and considerable effort has been put in place to develop the policies and procedures to implement them. States (in red) where TR4 has been observed: 4-Bihar; 27-Uttar Pradesh; 14-Madhya Pradesh and 7-Gujarat. Even though it has been known to be in India since at least 2015, in the State of Bihar, the presence of Tropical race 4 (TR4) in the world's largest producer of bananas had not been officially confirmed. It now has with the posting on 27 November 2018 of a First Report in Plant Disease. The isolates were collected from symptomatic plants in the State of Uttar Pradesh where, in June 2017, symptoms of Fusarium wilt had been observed on 'Grand Naine' in the Faizabad district. Further surveys confirmed the presence of TR4 in the districts of Kushi Nagar and Ambedkar Nagar. The fungal strain has also been reported to be in the States of Madhya Pradesh and Gujarat. The British television channel ITV has reported that the fungal disease which has been wreaking havoc in Southeast Asia’s banana plantations and beyond has found a home at the Eden Project’s Rainforest Biome in Cornwall, England. Plant pathologist Dr Rachel Warmington told ITV news that they were surprised to find Fusarium wilt in their banana exhibit, but have since used the presence of the fungus as an opportunity for research. Warmington confirmed to ProMusa that the fungus in question is Tropical race 4 (TR4). “It was identified in 2009, when the disease was first observed in the banana exhibit. We changed the plants and the soil, but the fungus reappeared in 2015 in a different part of the biome where there are also banana plants. We removed the affected varieties, 'Pisang mas' and 'Pisang Masak Hijau', a Cavendish cultivar. We also planted Allium tuberosum (Chinese chives) in the affected area to help suppress the disease and limit the impact on the remaining bananas. Eden Project is also collaborating with the University of Exeter on several research projects looking at biocontrol measures." If TR4 has found its way to the Eden Project, it is possible that it is also present in other European gardens. “It is certainly an indication that the disease is likely to be moving in the amenity horticulture trade and botanic garden collections,” says Warmington. Biosecurity Queenland announced that it has developed a system of certification for farms infested with Tropical Race 4 (TR4) that meet the requirements for interstate and intrastate quarantine purposes (Inspection of bananas for freedom of soil and plant material). The system allows accredited businesses to certify their fruit consignments without putting the wider industry at risk. Accredited farms will be visited by biosecurity officers to audit the fruit inspection process and ensure that biosecurity requirements are being met. In May 2018, Israel's National Plant Protection Organization (NPPO) officially declared that Tropical race 4 (TR4), the fungal strain that causes Fusarium wilt in a wide range of bananas, had been eradicated from Israel. In 2016, symptoms of the disease on the cultivar 'Grande Naine' (a Cavendish type) were observed by farmers from Shfeya (Carmel coastal plain). Two months later, similar symptoms were also observed by farmers from Kibbutz Ein Gev, along the eastern shores of Lake Galilee. Samples were collected from symptomatic banana plants and sent for diagnosis to the Plant Protection and Inspection Services of the Ministry of Agriculture. Fusarium oxysporum f. sp. cubense was isolated from symptomatic tissues and identified by PCR in July 2016. TR4 was confirmed by sequencing different regions of the genome (28S ribosomal RNA, a putative pathogenicity protein gene, and TR4 marker genomic sequence). This was the first report of TR4 in Israel. The two outbreak areas were confined and placed under strict supervision and surveillance by the Israeli NPPO. The area was fenced and cordoned off. All affected plants were destroyed and irrigation terminated. Intensive surveys in adjacent plots conducted since 2016 did not detect the pathogen and no new incursions have been reported. The NPPO therefore concluded that TR4 had been successfully eradicated. For the first time, scientists have been able to infer the origin of incursions of the Tropical race 4 (TR4) fungus that causes Fusarium wilt in Cavendish bananas, as well as many other types. In a paper published in Frontiers in Plant Science, the scientists not only confirmed the presence of TR4 in Myanmar, they also uncovered molecular evidence that this particular strain, as well as the ones present in Laos and Vietnam, were likely introduced from China. Their analyses also revealed that the TR4 strains in the Philippines and Pakistan are closely related, and that the TR4 incursions in Lebanon and Jordan are associated. The authors of the paper underscore the need for awareness campaigns and the implementation of validated quarantine measures to prevent further dissemination of TR4. The report of a suspected case of Tropical race 4 (TR4) in Queensland, Australia, has been confirmed by Biosecurity Queensland. This is the third such case since the first report of TR4 in Queensland in early 2015. The property on which the fungus was first discovered has since been bought out by the industry and shut down. The second incursion of the disease was found in July 2017 on a property owned by one of the largest growers in the country. The Minister for Agricultural Industry Development and Fisheries attributed minimal farm downtime on the third infested property to a prompt response by Biosecurity Queensland officers and the farm already having an established on-farm biosecurity plan. In Queensland, infested farms must abide by biosecurity protocols to continue trading, which explains why the rate of spread has been extremely slow compared to worlwide experience. 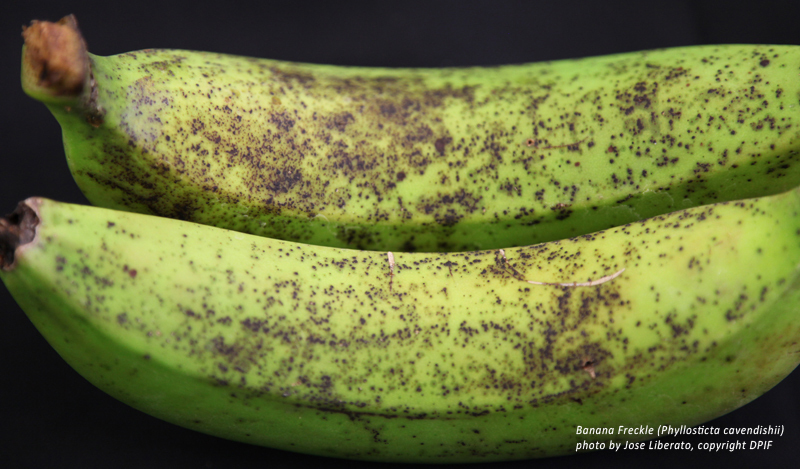 Nature Communications published the results of a field trial of Cavendish banana plants engineered to be resistant to TR4, the fungal strain that causes Fusarium wilt in Cavendish cultivars. The trial site was a commercial banana plantation in the Northern Territory of Australia where TR4 has become endemic. Two of the evaluated lines were still free of the disease after three years. One had received a resistance gene isolated from a wild relative of the banana, whereas the other had received an anti-apoptosis gene derived from a nematode. By contrast, 67%-100% of the control banana plants were either dead or infected by the fungus after three years, including GCTCV-218. According to the authors, the tissue-culture variant was as susceptible as the Cavendish cultivar Williams. Tropical race 4 (TR4) has been reported in Laos and Vietnam, where symptoms typical of Fusarium wilt have been observed as early as 2014. Laos and Vietnam are two of the countries in the region that have seen a surge in Cavendish plantations set up by Chinese investors to meet the demand for bananas in China, where TR4 is present in all banana-producing regions. The other countries are Myanmar, Cambodia and Thailand. A vegetative compatibility test confirmed the presence of TR4 on a banana farm in Australia's Tully Valley, the second such confirmation since March 2015. Earlier this month, Biosecurity Queensland had acted swiftly by issuing a biosecurity notice while waiting for confirmation. It was later revealed that the samples came from Australia's largest banana grower, who has indicated that production will continue despite the added costs on operation. The farm's spokesperson is confident that the incursion can be contained. Addendum: A new case was confirmed on the same farm in July 2018. The Cornell Alliance for Science announced that a banana genetically modified to be resitant to the Banana bunchy top virus is in its first year of confined field trials in Malawi. The banana was developed by Queensland University of Technology in Australia. ABC Rural announced that Australia's gene technology regulator approved a field trial of genetically modified Grande Naine bananas (a Cavendish cultivar). They were modified to be resistant to the TR4 strain of Fusarium oxysporum f. sp. cubense, the causal agent of Fusarium wilt, better known as Panama disease. Four of the lines that were part of a trial that was interrupted when the plants were removed under the Banana Freckle Eradication program will be screened along with new lines. Chemistry students at the University of Costa Rica developed biodegradable bunch covers, for which they won a prize at the Feria de Emprendimiento Desarrollo e Innovación. The main components are plant cellulose, cassava starch and chitin extracted from shrimp shells. The covers are five times more resistant than the conventional ones and are equipped with a system to gradually release pesticides. They take 18 months to disintegrate. Genetically modified Dwarf Cavendish plants representing various combinations of transgenes and promoters were field trialed in Australia with the view of transferring the technology to East African highland banana cultivars in Uganda. While none of the lines in the plant crop met the target of 50% of the Estimated Average Requirement (EAR) for vitamin A in vulnerable populations, 11 lines exceeded the target in the ratoon crop. According to the authors, the results "demonstrate that, rather than there being a reduction of expression with successive vegetative generations as a result of transgene silencing, the trait was stable". The results were published in Plant Biotechnology Journal.